BOSTON, MA – The Boston Red Sox announced various events and initiatives for Mother’s Day on Sunday, May 9, 2010 at Fenway Park, including a Walk in the Park in the morning and evening activities to raise breast cancer awareness. During pre-game ceremonies prior to the 8:05 p.m. game vs. the New York Yankees, the club will recognize a number of individuals who have been affected by the disease personally or have family members who are battling and/or surviving breast cancer. The Red Sox are proud to be a part of The Mother’s Day “Going to Bat for Breast Cancer” initiative, a joint effort between Susan G. Komen for the Cure and Major League Baseball. Mother’s Day Walk in the Park: The Walk in the Park presented by Red Sox Banking only at Bank of America, will take place on Sunday, May 9 from 9:00 – 11:00 a.m. This free-of-cost event gives fans an opportunity to bring their mothers to the ballpark and take a leisurely stroll on the warning track at America’s Most Beloved Ballpark. 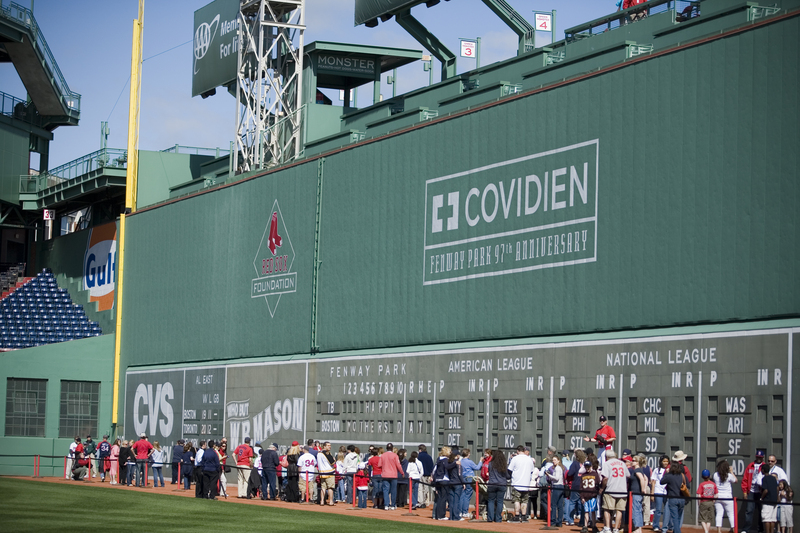 Fans can have their photos taken with the 2004 and 2007 World Series Trophies and Wally the Green Monster who will be accompanied by Mama Monster. Red Sox Alumni Bob Montgomery (9:00 – 10:00 a.m.) and Luis Tiant (10:00 – 11:00 a.m.) will also be present for autographs and photos as will Red Sox outfielder/infielder Bill Hall (10:00 – 11:00 a.m.). Additionally, a face-painter and balloon artist will be at Fenway to provide entertainment to children and all mothers will receive carnations as they leave the park. The entrance to the ballpark will be through Gate C.
Player Participation: Red Sox players will join MLB players throughout the league on Sunday in sporting a pink ribbon on their home white uniforms to help raise breast cancer awareness. Various players will also use pink wristbands and players who use Louisville Slugger bats will also be using customized pink bats stamped with the MLB breast cancer logo for a portion of the game. Dugout lineup cards will also be pink. Honorary Bat Girl: Bridget Spence was chosen by Major League Baseball as the club’s Honorary Bat Girl for the game, and will be honored during pre-game ceremonies. Spence was selected as part of an initiative to recognize incredible baseball fans who have “Gone to Bat Against Breast Cancer” in their daily lives where MLB chose one exceptional individual for each of the 30 teams. Spence has been battling Stage 4 breast cancer for five years and is about to embark on clinical trials after conventional chemotherapy and surgery failed to slow down the aggressive growth of the tumor. Other Pre-Game and In-Game Activities: 20 individuals who are all breast cancer patients or their family members will make up a “pink zone” at Fenway Park on Sunday. The Red Sox donated these game tickets to Susan G. Komen for the Cure, who invited these brave women and men to the game. The group, which will be outfitted in special pink t-shirts, will also be recognized on the field during the pre-game ceremonies. One of these individuals Angela Dias from Malden, MA will be delivering the Ceremonial First Pitch while another, Peter Devereaux from Andover, MA will say ‘Play Ball’ before the game. Additionally, Gisela Johnson, daughter of an 11-year metastatic breast cancer survivor, will be performing the National Anthem and God Bless America. A Komen-produced awareness video and important facts regarding the disease will run on the scoreboard throughout the game. “Happy Mother’s Day” messages taped by Red Sox players will also be played on the centerfield videoboard during the game. According to Susan G. Komen for the Cure, Breast cancer is the most common cancer among women, excluding cancers of the skin, accounting for more than 25% of cancers diagnosed in US women. Breast cancer occurs in men as well, accounting for 1% of all breast cancer diagnoses. Massachusetts has the 4th highest incidence rate in the United States. For Latina women breast cancer is the most common cause of cancer deaths in Massachusetts. Currently, there is neither a cure for breast cancer nor any known way to prevent it, making early detection key to survival. Early detection can be an extremely effective tool: if breast cancer is found and diagnosed while still confined to the breast, the 5-year relative survival rate is 98 percent. BOSTON, MA–The Boston Red Sox today signed right-handed pitcher Josh Beckett to a four-year contract extension through the 2014 season. Terms were not disclosed. FORT MYERS, FL–The Boston Red Sox today signed shortstop Nomar Garciaparra to a minor league contract. Immediately following the agreement, Garciaparra announced his retirement. The announcements were made by Executive Vice President/General Manager Theo Epstein and Garciaparra. Garciaparra, 36, owns a .313 (1,747-for-5,586) batting average, 229 homers and 936 RBI in 1,434 career games over 14 Major League campaigns with the Red Sox (1996-2004), Cubs (2004-05), Dodgers (2006-08) and Athletics (2009). During his nine seasons in Boston he compiled a .323 (1,281-for-3,968) batting average, 178 homers and 690 RBI in 966 games. He is fourth in club history in career batting average and fifth in slugging (.553) among players with at least 1,500 at-bats. Garciaparra also ranks among Boston’s top 15 in career doubles (9th, 279), extra-base hits (9th, 507), home runs (11th, 178), total bases (11th, 2,194), runs (12th, 709) and hits (14th, 1,281). He was originally selected by the Red Sox with the 12th overall pick in first round of the 1994 First-Year Player Draft out of Georgia Tech. He was dealt to the Cubs as part of a four-team trade on July 31, 2004. Along with seeing the 2010 take on Major Leaguers for this first time this spring, tonight also marks the first game of the all-important Mayor’s Cup. Go get ’em boys!! Kelly shines, and Ortiz goes yaahhhhd!! YEAH YEAH YEAH!!! Baseball is back!